I can't believe it's only day 6 of the nail challenge. It seems like it's been going on forever. I hope I can make it to the end because I might be running out of ideas. I need some inspiration! I also whitened my nails a bit today. I used peroxide and baking soda to whiten them. The yellow stains didn't come off completely, but my nails did look a bit better after cleaning them. They were pretty bad. I should probably let them breathe, but I doubt that will happen haha. 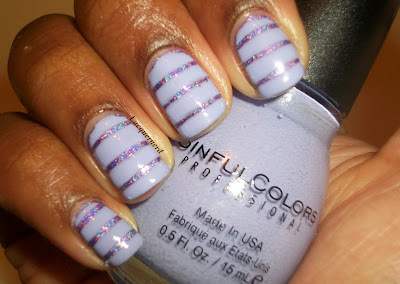 For purple, I have a tape manicure for you! I haven't done a tape manicure in a while, but I forgot how cool they can look (and time consuming!) Once I got the hang of it, it was really simple to do. For this manicure, I painted two coats of Color Club's Eternal Beauty as the base. Once that dried completely, I laid three pieces of striping tape horizontally on the nail. 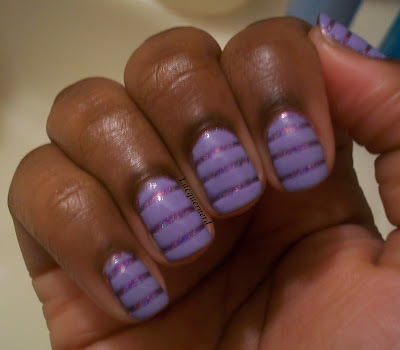 Then, I painted one coat of Sinful Colors Candy Coated over the tape. You want to get enough that it covers the nail. Next, I slowly peeled the tape off. Once it's dry, I finished the design off with a top coat! The flash makes Candy Coated look lighter than it is, but you can get a better look at how Eternal Beauty looks underneath! I wish I could have captured the Eternal Beauty better with my camera. It's such a beautiful color and one of my favorite purple polishes. What do you think of this design? Tomorrow is black and white nails! Very cute :) Those two purples look amazing together!